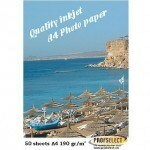 Photo in soap with pour soap with your inkjet printer. Easy and cheap! Make by yourself something unique and personal, the possibilities are unlimitled. 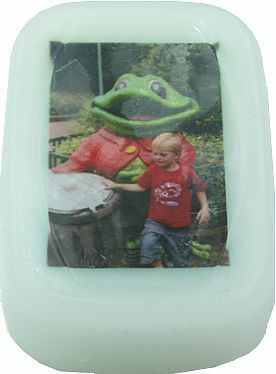 With a Photo in soap (pour soap) you makes a beautiful decoration or gift in no-time. Think of a maternity gift, company logo, your (grand) child or your pet. At the bottom of this page we are a movie. We start with a small layer of clear pour soap in the mould, not more than 1 a 2 mm. How thicker the layer how fuzzier the photo. The clear soap have to be real clear! Not all are, our soap is perfect for it. On the net there you can buy soluble paper, its nice that the paper disappears but is it so bad as it stays in the soap? Other problem is that this paper is only for a laser printer, most people dont have it at home and the paper is expensive. You can print it also on home with your inkjet printer, Profselect (use 190 grams paper) have a water resistant paper for a inktet printer. It’s cheap (16 cent / a4) en perfect for home use. 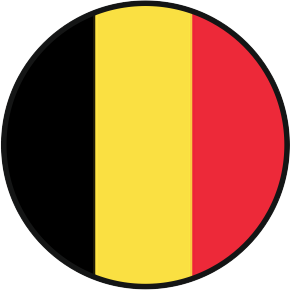 Disadvantage of inkjet is that there is a risk that the ink a (small) bit of prejudice after over time. To make this risk smaller we spray a little Color / protection spray on the photo. This is a plastic layer gives the photo extra protection. Warning: with a inkjet printer is always a risk that the ink blurs slightly in the soap!